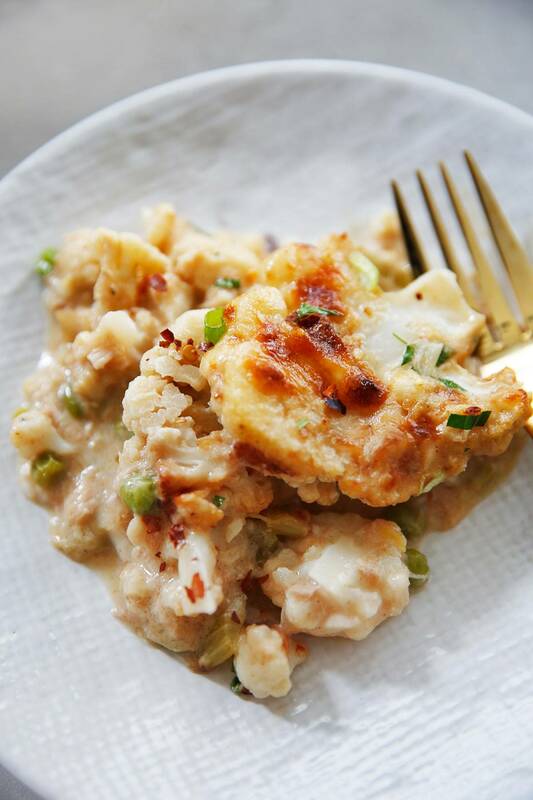 This Low Carb Tuna Casserole (With Cauliflower) is the perfect comfort food meal! It’s easy to prepare, comes together in one casserole dish, and is packed with protein, veggies and we’ve offered two versions to make it low-carb with or without gluten-free pasta. Made in partnership with my friends at Genova Seafood. Tuna casserole is such a classic comfort food! It’s creamy, cheesy and delicious but typically loaded with pasta and processed condensed soup! No hate on that version, but we decided it was time to re-make this dish making it gluten-free and low-carb. We tested two versions, one with pasta and one without so you can choose what amount of carbs you’d like! For the lower carb version, we use half cauliflower and half brown rice pasta. This version is a bit more kid-friendly and has more of a classic feel to it. 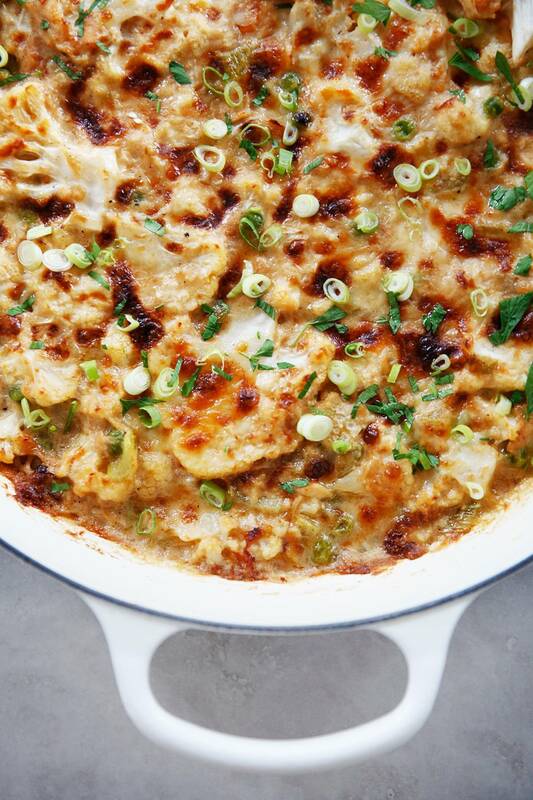 For our low carb version we completely swapped out the pasta for cauliflower to keep all that decadent creaminess without any of the guilt for all of those on a low carb diet (oh hey keto diet). Either way, with whatever version you choose, you’re going to be satisfied after eating this tuna noodle casserole! Of course we made this in partnernship with my friends at Genova Seafood. They are my favorite, trusted tuna company. 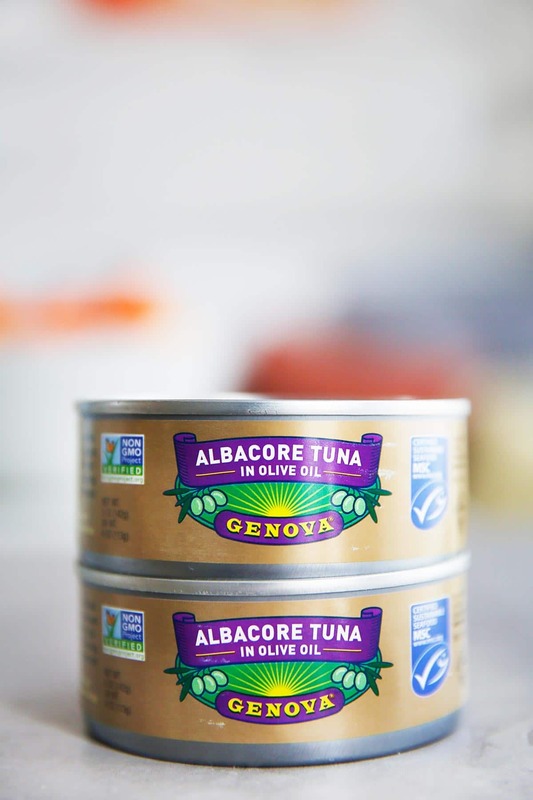 Genova sources 100% of their tuna from fisheries that are MSC certified, meaning their tuna is sustainably sourced! It honestly is the best premium tuna in the purest olive oil. It is my favorite tasting tuna out there! Always non-GMO, wild-caught, and has 14g of protein in every serving! MSC certified products must meet rigorous standards for sustainable fishing practices, like limiting by-catch (unwanted fish), avoiding overfishing and protecting marine environments. Today, only 12% of global wild caught seafood is MSC certified, and Genova Seafood is one of the companies working hard to make a change! How do you make homemade tuna noodle casserole? If you’re making the pasta version you boil the pasta until al dente. Saute your aromatics. Here we are using onion, celery and garlic. Make your base cheese-y sauce (also called a béchamel), using gluten-free ingredients, of course. Add in the cauliflower and cooked pasta (if using) and bake! We love using an oven safe pan to both start the casserole on the stove and then finish in the oven. Heat a large heavy bottom pan, over medium heat and melt butter. Add onion and celery cook until beginning to soften, about 5-7 minutes. Add garlic, and cook for 30 seconds. Add dijon mustard, salt, pepper, paprika and cayenne, if using, and whisk to combine. Add cauliflower and simmer for 5 minutes, stirring occasionally. Remove from heat and stir in 3/4 cup of cheese. Then add in Genova Seafood Tuna, al dente cooked pasta (Omit for Low Carb Version), frozen peas and mix to fully combine. 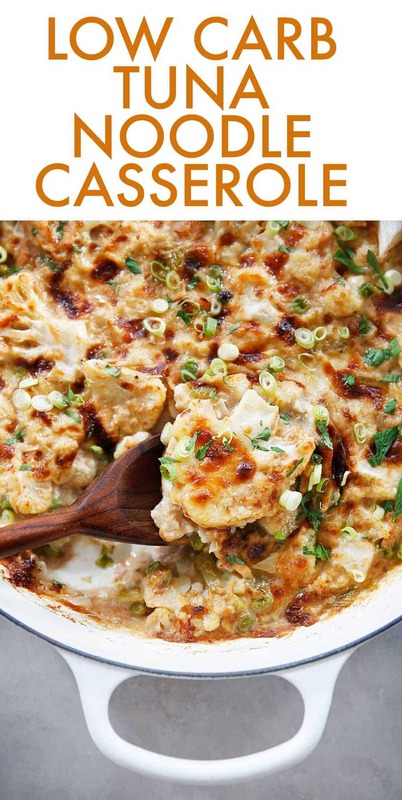 Pour into an oven safe dish (if not using one already) and top with remaining 1/4 cup cheese and bake until cauliflower is tender and cheese is melted, 15-20 minutes. If you want the cheese to be bubbly and slightly browned, place under the broiler for 3-5 minutes. Top with scallions and let sit for 5 minutes before serving. 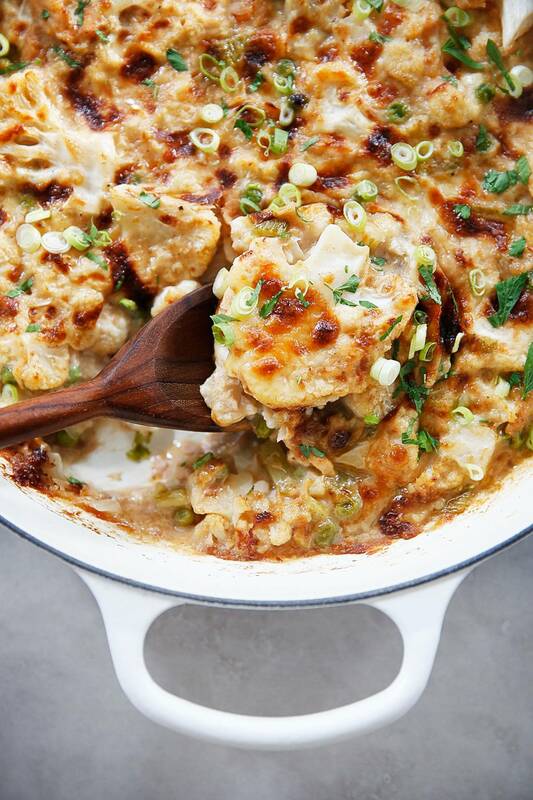 The sauce may seem really thick before it goes in to the oven, but the cauliflower and the tuna exude a lot of liquid so the extra thick sauce stops it from becoming to0 watery after it is baked. I LOVED tuna noodle casserole as a kid and it’s been so long since I’ve had it! This is a great reminder that it’s entirely possible to make a cleaner GF version. I want to dive right into that casserole dish! I’m a calorie counter, wish nutritional values were displayed. I want to make this recipe! Feel free to use any free online calorie calculator like My Fitness Pal! ENJOY! Can’t wait to try this! What cheese do you recommend? Hi Julie! Kelli here, I’m part of the LCK team. We updated to include our favorite cheese with this recipe: sharp cheddar! Enjoy! Seriously, what CAN’T cauliflower do?! 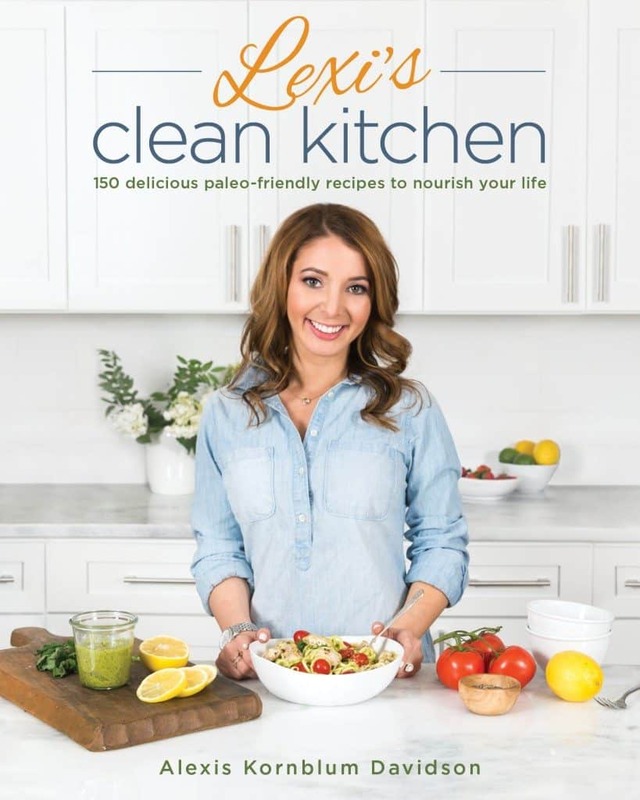 I agree with Gaby’s comment, “what can’t cauliflower do?” ha! You make this look delectable, I’m bookmarking now! I’ve never used tuna in oil, would tuna in water dry this out too much? I’m trying to keep to high protein but also, lower calorie…I have you tried it this way? 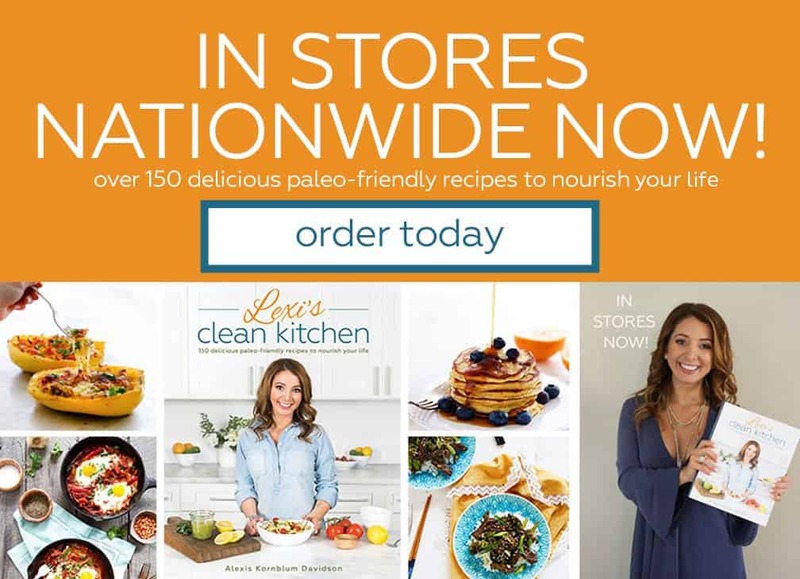 just got a great new resource for more low carb recipes, Melanie Wildman’s, The Ultimate Protein Cookbook. I love it. You might like it too! 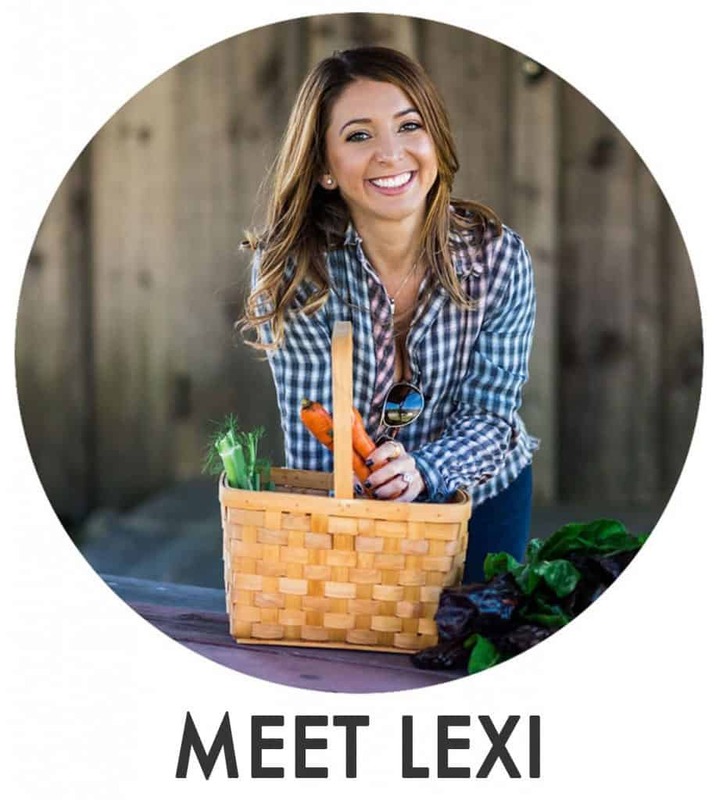 Thanks for this recipe Lexi! This tuna casserole looks amazing! I just need to go do a market run so I can get the right ingredients to make it. thanks! Good stuff right here! Made this for dinner tonight. I added mushrooms and extra peas and I put some pork rind dust on top. So good and no unhappy tummy! Thank you! Looks great. Could I use xanthum gum instead of arrowroot?